When we came across a rabbi and a violinist playing in the rain on a Jerusalem street two weeks ago, we pulled out our smart phone and captured a few minutes of their antics to post here as a Jerusalem curiosity. After some searching on the Internet, we discovered that the duo, known as The Rabbi and Gypsy Lady, are regular performers in Kikar Zion (Zion Square) and also on stage in clubs and theaters around Israel. Who are these street and theater performers? Rabbi Tomer Peretz's day job is as a teacher of Torah and Talmud, but he is also a singer, composer and guitarist, and can be found often at the junction of Ben Yehuda Street and Jaffa Road in Zion Square. His musical partner is Alexandra Kanarit. This "Gypsy Lady" is a violinist and composer from the Ukraine. 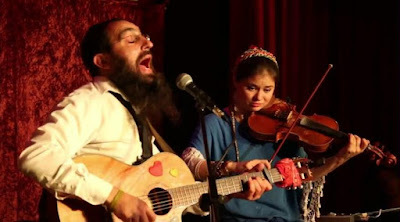 Together they are The Rabbi & Gypsy Lady who for most of their lives have created music and shared their love with other people through art performance. They love what they do and they do what they love. For the last three years both of them have separately been engaged in street shows, making people happy. One day they met each other at Kikar Zion, Jerusalem, immediately connected with mutual common energy. Two people who became one through art and now The Rabbi and Gypsy Lady perform together. They play a wide range of Israeli songs and their original compositions, but they seem especially drawn to rock music. Two of their favorites are Stairway to Heaven, the Led Zeppelin standby, and Ain't no Sunshine, the song made popular by Bill Withers. Here is one of their performances of Ain't no Sunshine at the Theatron HaStudio in Haifa. Any resemblance between this and music is just a coincidence.